Two United Methodist Churches in southeast Missouri were occupied by the military for more than a week in September. The joint act of community service had people lined up outside the doors each morning. The U.S. Department of Defense was conducting an Innovative Readiness Training dubbed Operation Healthy Delta. The troops set up at Eastwood Memorial United Methodist Church in Caruthersville and Charleston United Methodist Church to provide medical, dental and optical services to the community at no cost to the patients. Rev. 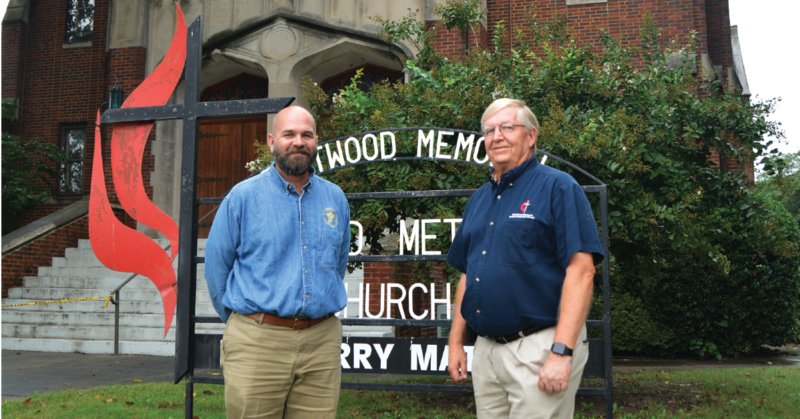 Jerry Mattson is the pastor at Eastwood Memorial UMC in Caruthersville. Prior to the event he talked to community leaders to get the word out about the opportunity. Nearly 100 people were lined up outside the door before it opened on the first day. Hosting the event did create additional cost and inconvenience for the church, but the congregation didn’t blink. “Everyone in the church was very supportive of us donating our facility to help the community in this way,” Mattson said. The troops not only used Eastwood Memorial UMC as the facility to offer their medical services, they also lived at the church while in Caruthersville. Sunday School was cancelled for that Sunday, because the Sunday school classrooms were all being used for either medical services or living quarters. The Missouri Air National Guard 131st Bomb Wing, which has units split between Whiteman Air Force Base and St. Louis-based Jefferson Barracks, had a lead role in coordinating the operation. To carry out the mission, the 131st is also partnered with its federal Air National Guard counterparts and units, the Navy Reserve, and the Air Force. In total, about 200 service members participated from numerous units, including elements of the New Jersey ANG’s 108th Air Refuelling Wing, the New York ANG’s 109th Airlift Wing, Navy Reserve Expeditionary Force One, and the regular Air Force. 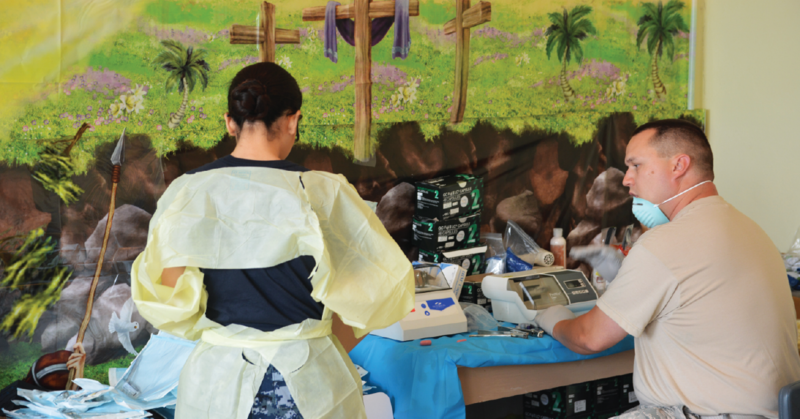 Operation Healthy Delta marks the first time active duty Air Force dental personnel are joining the training exercise and working alongside their ANG and Navy Reserve counterparts. The soldiers were doctors, dentists, nurses, medics, optometrists, pharmacist and other medical professionals. Although assembled from different branches of the services and different parts of the country, they quickly functioned as a team. Luke Stitch from Madison, Wisconsin, was the Site Officer in Charge at Caruthersville. Stitch expressed a lot of appreciation for the hospitality of the church. Joel Evans is president and chief executive officer of the Delta Area Economic Opportunity Corporation. He said Pemiscot and Mississippi counties have many residents who are in need of affordable healthcare. He expressed appreciation for the support of the churches. “The partnership across denominations here is phenomenal,” Evans said. The Catholic church was being used for the initial intakes and assessments. It also had tables set up from community agencies that were offering other services. The procedures were taking place at the Methodist Church. The Methodist Church also housed the military personnel, who brought cots and slept in classrooms. 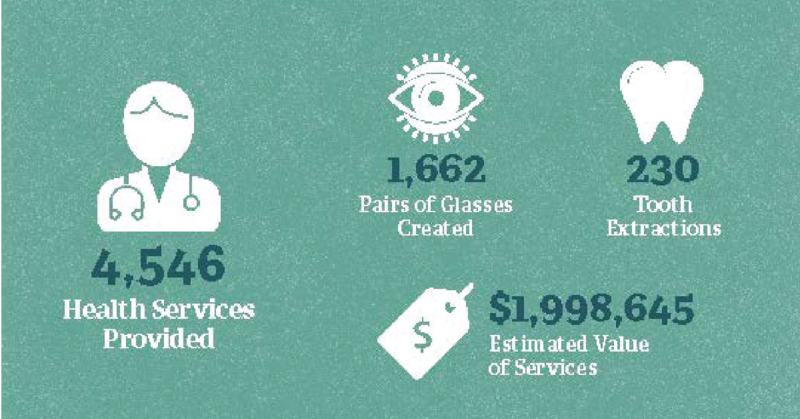 Some of the military personnel set up in a DAEOC warehouse in Portageville to make glasses, which were then given to the people who needed them according to the eye exams. About an hour away at Charleston UMC, the operation was identical to the one going on in Caruthersville. Rev. Rob Webster said his church embraced the idea right from the beginning. The church at Charleston is about 20 years old, but looks as bright and fresh as if it were just opened last week. Navy Chief Alay Apuzzo was the senior enlisted leader at the Charleston operation. She is originally from Puerto Rico, but now lives in Washington, D.C. This was her first operation of this nature. She liked Missouri from the moment she arrived. Webster said the gratitude was flowing both ways. Lt. Commander Joseph Fugaro was the medical group commander at Charleston. He’s part of the 131st Bomber Wing at Whitman Air Force Base. In his civilian job, he’s medical director at Landmark Hospital in Cape Girardeau. It gave him some home-field advantage. In some cases, a person may have come in to see a dentist, but a blood pressure problem may be discovered in the assessment that takes priority. The military wasn’t part of Fugaro’s career plans from the beginning. He was a practicing general thoracic surgeon when he decided he wanted something different out of life. He enjoys seeing the military medical personnel quickly merge into a cohesive, highly functional team. Fugaro appreciated the churches opening their doors to the operation. 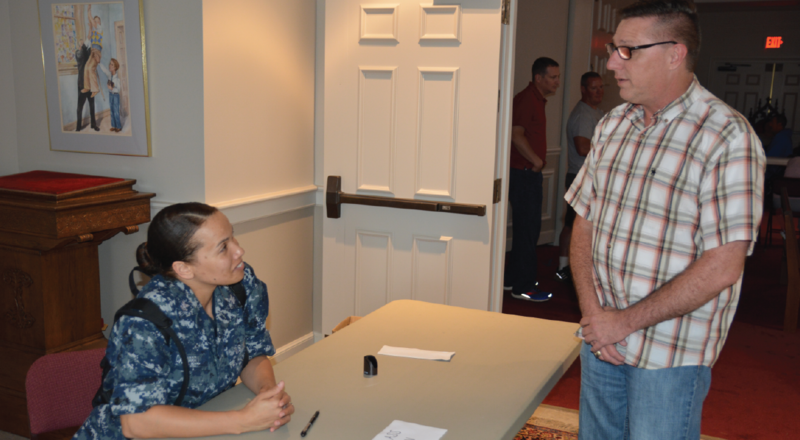 In Charleston all of the medical intakes and services took place at the United Methodist Church, and the military personnel stayed at the Baptist church while they were there. David Gamache of New Jersey said the operation was in the planning stages for about a year. He’s part of the 108th Medical Dental Group. There were about 10 dentists and 10 dental techs and hygienists there. He has participated in similar operations in Texas, the arctic and overseas. That doesn’t mean he knows what to expect, though. He said many people have been putting off dental issues, awaiting their arrival. He finds the work rewarding. The congregations felt the same way. Both churches were excited about the event in its coming and happy to have been able to be there to support it when it was all over. “They (the military) provided a wonderful boost to our area. I was so proud of the way these men and women were received,” Mattson said.